The Request for Proposal process for selecting email service providers is flawed at many large organizations, and that’s leading brands to make decisions that aren’t adequately serving their needs, a new research report from MessageGears finds. 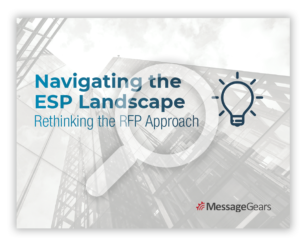 MessageGears’ report, titled Navigating the ESP Landscape: Rethinking the RFP Approach, reveals that the shortcuts many companies take to create an RFP — 62% said their company changed less than half of the content from one RFP to the next, and 55% said they entered the RFP with a preferred vendor in mind — are a big part of what’s leading to a process that generates decisions not based in today’s facts about the ESP industry but instead on outdated evaluations both of ESP technology and the company’s own interests. In addition, this is leading to misconceptions about the array of features available to companies within the ESP landscape. Almost three-fourths of respondents were likely to say that all ESPs are basically the same. These attitudes were even more likely to be found among key decision makers, with 29% of them strongly agreeing that all ESPs are the same, versus 7% of others. You can download the full report at MessageGears’ website. MessageGears will also be hosting a webinar at 11 a.m. on Jan. 24 with Barnette and Marketing Democracy founder Chris Marriott talking about the survey’s findings and their recommendations for improving the RFP process. MessageGears is the only cross-channel messaging platform exclusively built for today’s enterprise. We empower the world’s most demanding marketers to deliver more relevant campaigns, faster and more flexibly than legacy cloud ESPs. Our unique Hybrid technology connects directly with a company’s database, enabling marketers to maximize the value of their customer data in real time – no syncing required. Join sophisticated marketers at Expedia, Ebates, and Chick-fil-A who rely on MessageGears to deliver more personalized cross-channel campaigns that grow their business. Stop syncing and start sending better emails. Learn more at messagegears.com.